Impress everyone at the party with this nifty can dispensing cooler. It’ll holds up to 16 (160z.) cans. 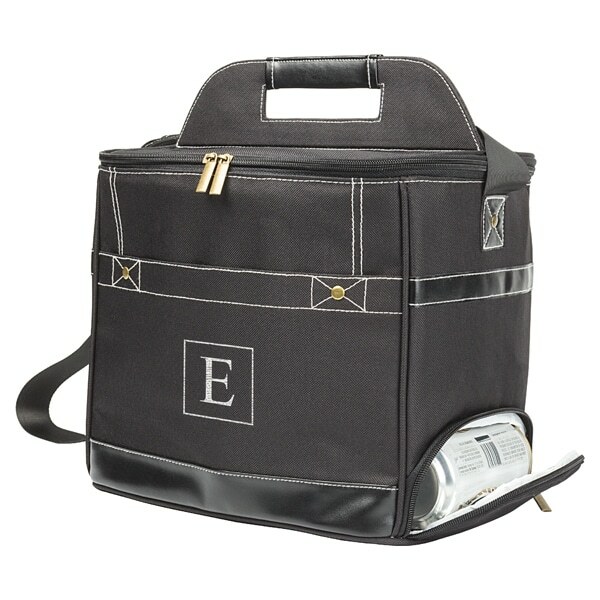 We’ll embroider initials on the front of the cooler for no extra cost! Scroll down to see video of the cooler in use. Make cracking open a cold brew at your next tailgate or hike that much easier with the Personalized Black Can Dispenser Cooler. 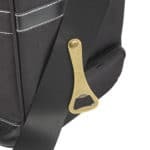 With the zippered side opening for handy can release, and bottle cap opener attached to the adjustable strap, enjoying a beer has never been so convenient! Forged from a durable polyester and accented with gold metal hardware, this cooler also features a front pocket for extra storage and space inside for up to 16 cans. 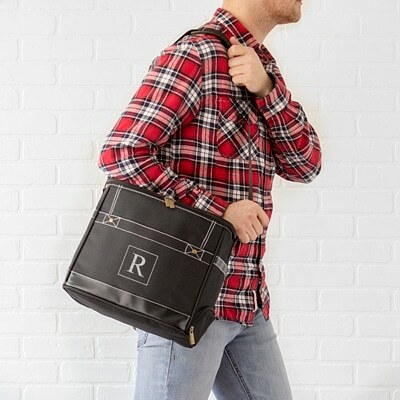 Give your groomsman or best friends the gift of a good time, and we will personalize it with either a single initial or three block initials at no additional cost! Free personalization: a single initial inside a square OR three block initials. Holds up to 16 (16 oz.) cans. Adjustable shoulder strap with attached bottle opener. 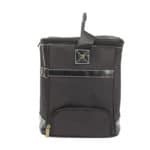 Cooler: 11" L x 8.5" W x 9.5" H.
Front pocket: 5.5" L x 11" W.
Adjustable strap: 47" L x 1.5" W.
Size-zippered opening: 3" L x 6.5" W.
Is the inside of the cooler easy to clean? Yes! Just rinse out with water and then lightly scrub with dish soap. Is the cooler air tight? 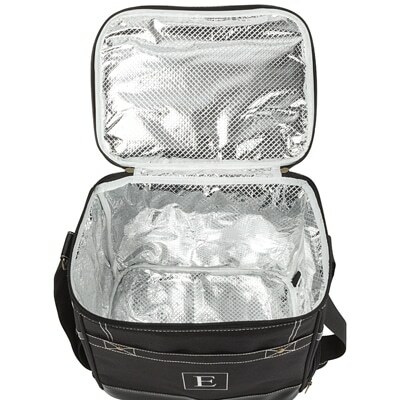 The cooler is not meant to hold ice for long periods of time due to the zipper opening at the bottom. We recommend using ice packs to avoid the possibility of leaking.